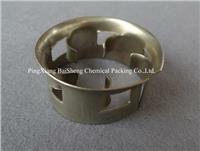 Metal cascade mini ring is made of material like carbon steel, stainless steel or Aluminum alloy, etc. The product has features such as thin wall, heat resistant, high free volume, high capacity, low resistance, high separation efficiency and so on. It is especially suitable for rectification towers under vacuum to treat thermo sensitive, decomposable, polymerizable or cokable systems, so it is widely used in packing towers in petrochemical industry, chemical fertilizer industry and environmental protection, etc. The above data on metal cascade ring is reference to material stainless steel (AISI304) in the material thickness shown. Other material available: carbon steel, stainless steel including 304, 304L, 410,316, 316L. Increased plant capacity is the direct result of the result of the reduction in pressure drop that Cascade Mini Rings provide, as this moves the operating point further away from the “critical pressure drop point” at which flooding occurs. This is typically 1-2 in., wc/ft or 10-20 mbar/in). This effect allows additional vapor/liquid handling and therefore increases plant capability.